Genuine Baltic Amber has been described in numerous ways: The Gold of the Baltic and Tears of the Gods. Surviving millions of years in the earth, Baltic Amber is a Fossilized Resin that has not only stood the test of time but forever changed it with the discovery of the host of inclusions that are contained within it giving scientists numerous samples of historical plant and Insect Species from that era. And Amber has been credited with serving as a primary support to the bodys immune system, breakthrough healing for a variety of illnesses and pain relief for everything from teething to arthritis. So we can add Homeopathic phenomenon to the multitude of attributes. 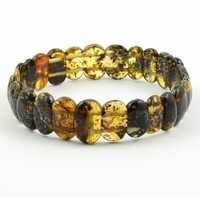 There are a variety of Colorations in Baltic Amber that range from red to blue to gold to almost pure white. One color that stands out as remarkable  and rare - is a composition of clear amber and verdant green, often referred to as Earth Amber. Containing a variety of soil and sediment from the earth as well as intense composition of numerous pieces of plant life, Green Amber is quite the collectors item. The biggest (and probably the best known), are deposits of Amber in the Baltic Region. In fact, these deposits are about 80% known amber in the world. Natural Baltic amber can be scientifically validated in age from 35 to 50 million years  no wonder it is one of the most valuable substance on world! And without doubt one of the most precious jewels in the form and renovated in numerous articles in countless forms of jewelry charms of the household arts high wall. With a global economy that makes artifacts such as genuine Baltic Amber available anywhere in the world, you can own your own piece of precious history. But when youre ready to become an Amber owner, be sure that your purchase is made from true amber artisans who carry only the genuine article.